Very merry Christmas to everyone! Thank You very much for following our trips during 2013! It’s been another busy year trekking the World and we are happy to now have some time off with our friends and families! Our next big travel-related event is the annual travel fair held in Helsinki from Jan 16th through 19th! Please come over for a chat at the Aventura stand! I will also be doing slide shows on Nepal trekking, Kilimanjaro and Aventura’s South America programs! After the fair it’s time for my annual Kilimanjaro trek starting on Jan 29th! We’ll be then trekking to Mount Kenya and Kilimanjaro and I am greatly looking forward to my 9th time on Kilimanjaro! We still have spots available so please contact Aventura office or my email samuli@samulimansikka.com for details! Mount Kenya & Kilimanjaro program can be found here! I have most of my year 2014 trips still to confirm. One upcoming trip I especially want to point out is the Altitude Junkies’ trip to Cholatse in October-November! Led by Phil Crampton, I will be assisting on the mountain. Please contact info@altitudejunkies.com or samuli@samulimansikka.com for more information on the trip! This is a super-fun, steep and technical climb on one of the most striking peaks in Khumbu, Nepal! It is led and operated with the same throughout approach as all Junkies trips. You will thus have the best changes to summit this peak safely being assisted by the awesome Junkies staff! 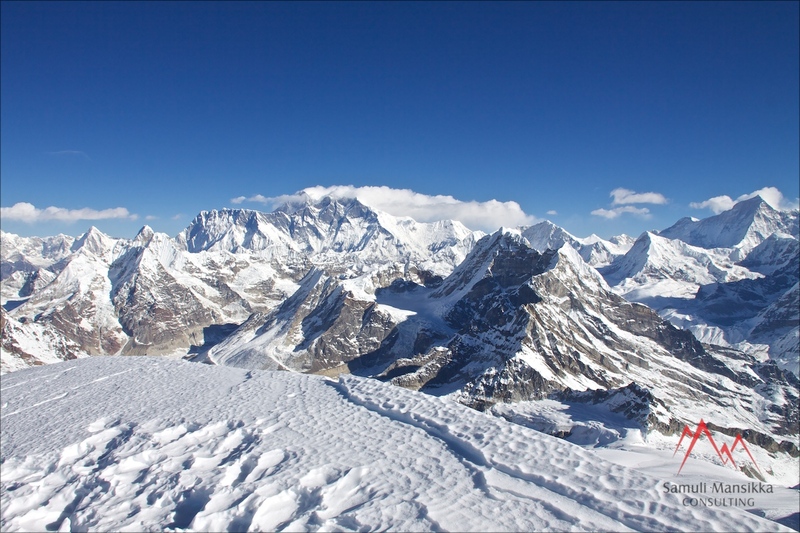 This is the perfect first climb if you have ever thought of something more technical and moderate altitude climbing in the Himalayas! Details are soon to be found here! Now, please enjoy your Christmas Holidays! Keep following us on Facebook and on Twitter to hear the latest news and updates on what we will be climbing and trekking in year 2014! Now you will also find me on Instagram!